July 5th, 2008. Cloudy, Rainy and warm, Water Temp 85* and Clear. Caught bait early and picked clients up at their dock at 5:30. Looked for a school for 10 minutes then found what I wanted to see on the graph. We put downlines on the Stripers and they started going down. Stripers started breaking around us, rods were going down and the guys were going nuts trying to keep up. I gave Doug a topwater plug, he made 3 casts and hooked up with the best fish of the day. Within 10 minutes we got busted and the buzzards moved in and naturally spooked the school. We hit a few more schools with success but every time we caught fish the inconsiderate trollers would run over us spooking the fish. Today we fished just this morning due to it being the holiday and worked 5 different schools of Stripers. 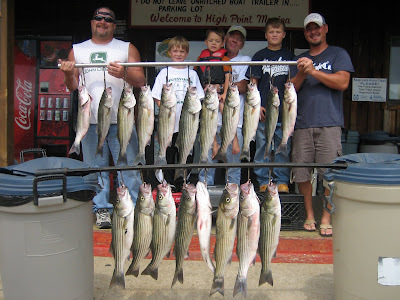 July 4th is always the start of numerous schools of Stripers busting the surface, so if you come to the lake this month make sure you have a topwater plug tied on.